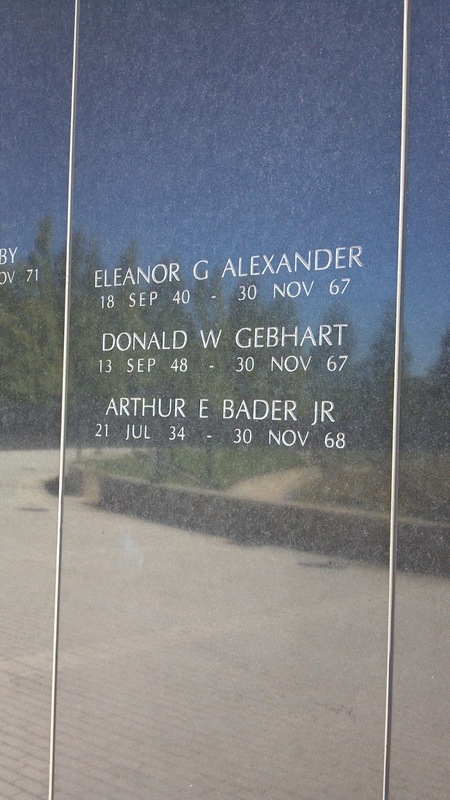 Of the 1563 fallen service members commemorated on the New Jersey Vietnam Veterans Memorial in Holmdel, only one is a woman: Captain Eleanor Grace Alexander. Every name on that wall has a compelling story, but viewing a female name, and learning about her, make a special impact on those who visit the memorial with no expectation of seeing a woman honored for her sacrifice in a war decades ago. New Jersey Vietnam Veterans Memorial. 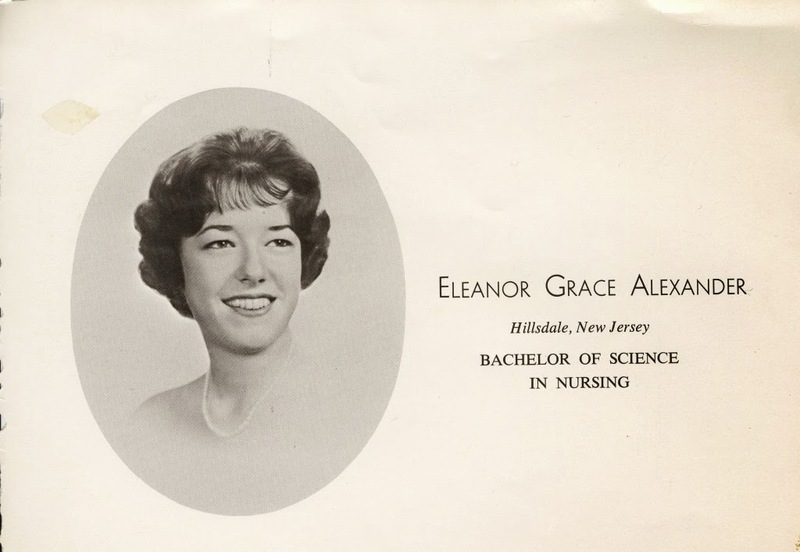 Affectionately described by family members as "a tough broad," the Queens-born Alexander moved to River Vale with her mother after graduating with a nursing degree from D'Youville College. Six years later, she'd achieved a measure of success as a cosmetic surgery operating room supervisor and was engaged to be married, yet felt compelled to enlist in the Army Nurse Corps. Friends suggested that she could offer her services in a safer environment by serving in the Peace Corps instead, but she was resolute in her desire to take the military route. In fact, she approached all of the services to see if they'd send her to Vietnam but only the Army would guarantee it. As her sister in law Suzanne Alexander later told the New York Times, "She told me she was going to do this before she had any obligations. She insisted on going over there for six months. She had to do this." She enlisted in May 1967, leaving behind her hope chest and wedding dress, and bringing a great deal of enthusiasm for the challenge ahead. Assigned to the 85th Evacuation Hospital at Qui Nhon, Vietnam, she was part of the team responsible for stabilizing seriously wounded patients, whether they be American, allied or enemy. A colleague recalled that "Rocky," as Alexander became known, was "top notch... never got rattled... even managed to look well groomed" in the chaos of field hospital work. Captain Alexander's D'Youville College yearbook photo, class of 61. A nursing scholarship was established there in her name. Five months into her enlistment, Alexander grabbed opportunity from coincidence, a decision that one could say cost her her life. As fighting intensified at the Battle of Dak To 60 miles away, the 85th was to send an emergency medical team to nearby Pleiku to treat the wounded. Another nurse was part of the team but couldn't be located in time, so Alexander took her colleague's gear and ran to join the departing group. She and the team worked grueling 14 hour shifts, an exhausting yet exhilarating regimen for the enthusiastic nurse. "The troops around Pleiku are getting hit quite hard," she wrote to her mother in mid November. "For the past three days, I've been running on about four hours sleep. Funny thing is, I love it." After six weeks, the team was returning to the 85th when their plane encountered rain and low clouds that would prevent their landing at Qui Nhon. They were diverted to another airstrip with better landing conditions but crashed into a mountainside while attempting to get there. Alexander, the other 21 passengers and four crew members were all killed in the accident. She was 27 years old and was posthumously awarded the Bronze Star. Accounts of Captain Alexander from those who served with her say much of her commitment and poise; it seems that many of the enlisted men at the hospital were enthralled by her beauty. Most touching is a letter written to Alexander in 1991 by the Army nurse whose place she seized for the Pleiku assignment. "How did you keep it together? You know, the guys really leaned on you," she wrote. "You and I triaged, organized, drove the men and prayed... I really admired your strength and envied it." The same nurse acknowledges that had events been a little different, she, herself, might have perished in the crash, and Alexander survived. She tells of the complex mix of guilt and sorrow she continued to feel, decades later, and her struggles to make a positive impact on the world in Alexander's memory. We often think of the sacrifices men made, and the fact that but for a twist of fate, an injury that prevents a deployment, a roll call missed, one soldier survives while the one who took his place dies or is injured. Until very recently, with women being further integrated into combat roles in Iraq and Afghanistan, most of us didn't consider that the beneficiaries or victims of fate could be female. Last September, the New Jersey Vietnam Veterans Memorial dedicated a new monument for Captain Alexander, ensuring that more visitors will learn about her dedication and sacrifice. She's a true example of the power of commitment and the unstoppable desire of some to make a positive impact on those around her.